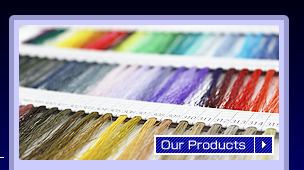 ONUKI supplies high quality polyester sewing threads for industrial use. Since the foundation in 1894 to date, as a leading manufacturer of industrial-use machine-sewing threads in Japan, we have provided a broad range of sewing threads made with various materials and made for various purposes. Today, our factories and sales offices in China equally offer quality products and services. Taking pride in being a pioneer in the Japanese textile industry, we continue to deliver high quality sewing threads into the future. ACE CROWN Industrial-use Sewing Tread Series offers a wide variety of sewing threads including polyester filament threads and spun threads. See Our Products page. Onuki Limited / 6 Hanbara, Aikawa-machi, Aiko-gun, Kanagawa Pref. Japan 243-0307 / Copyright (C) 2010 ONUKI LIMITED All Rights Reserved.